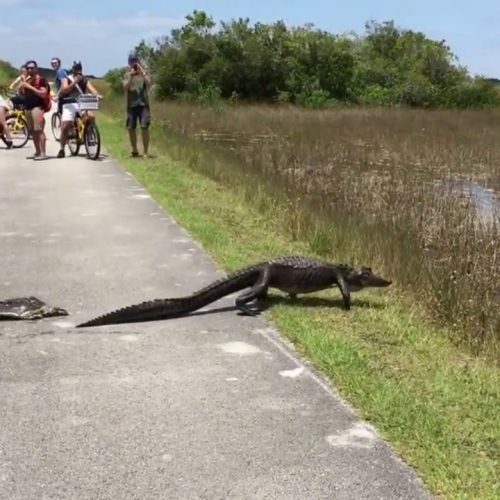 Everglades National Park is the third largest park in the lower 48 states, covering 2400 square miles. The park is heaven for lovers of outdoor sports, with loads of nature to watch, tons of trails for hikers, runners, and bikers, as well as sailing, snorkeling, fishing, and diving for water-sports fans. 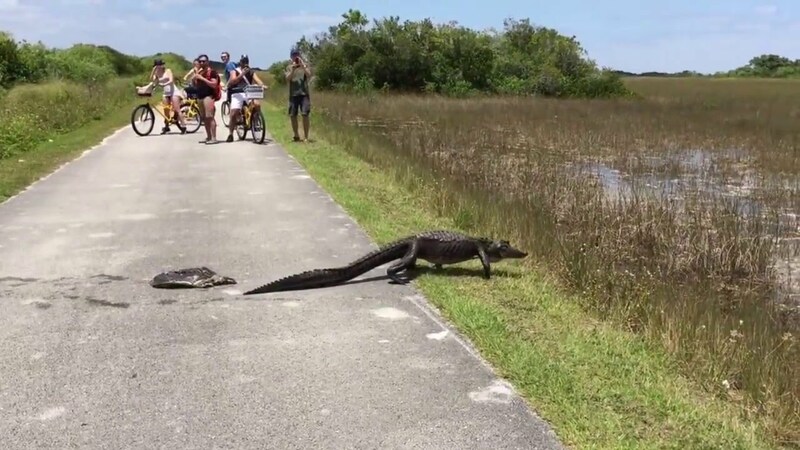 Everglades National Park offers many outdoor sports opportunities such as biking, canoeing, kayaking, or fishing to explore the natural beauty of this park through freshwater marsh, mangrove forests, and the open waters of Florida Bay. Bike, canoe, and kayak trips range from a few hours to several days depending on length and complexity of the trail. You can bring your own canoe or kayak and launch from several locations around the park or rentals are available at the Flamingo Marina or Gulf Coast Visitor Center. Alternatively you could hire a permitted guide who will outfit your trip and lead your adventure. 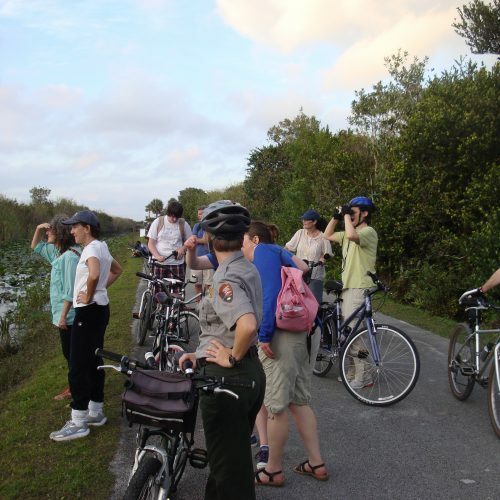 You can also take part in the Centennial Triathlon Challenge which includes hiking, biking, and paddling for a total of 100 miles in at least two south Florida National Park Service units. To learn more about this opportunity, pick up your free South Florida National Parks Centennial Triathlon Challenge passports at any south Florida National Park visitor center or welcome center. West Lake Trail: (walk) This self-guided boardwalk trail wanders through a forest of white mangrove, black mangrove, red mangrove, and buttonwood trees to the edge of West Lake. Snake Bight Trail: (walk or bicycle) Don’t let the name deter you! In this play on words, a “bight” is actually a bay (Snake Bight) within a larger bay (Florida Bay). Enter another world as you walk through a tropical hardwood hammock with dozens of tropical trees species. There’s excellent bird watching on the boardwalk at the end of the trail if you plan to arrive near high tide. 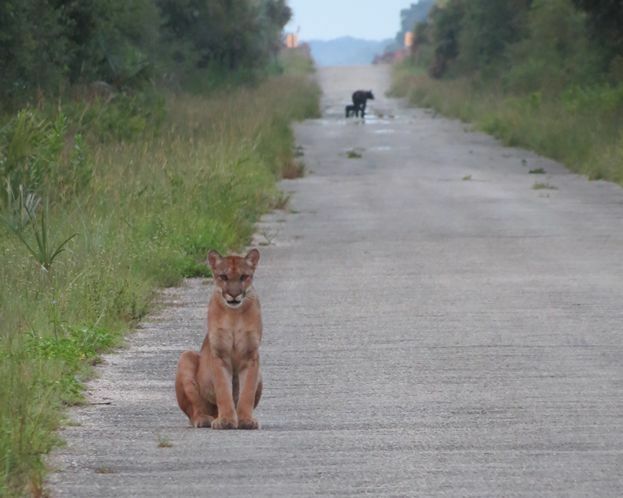 Rowdy Bend Trail: (walk or bicycle) Explore an overgrown road bed through shady buttonwoods and open coastal prairie. This is an opportunity for good woodland bird watching. Combine this trail with the main park road (use caution!) and the Snake Bight Trail for a 12.6-mile round-trip bike ride from the Flamingo Visitor Center. Christian Point Trail: (walk) Wander along a rustic path through a wide variety of habitats. The trail begins in dense mangroves and buttonwoods full of bromeliads, or airplants. Next, investigate the unusual, salt-loving vegetation of open coastal prairie. Dead buttonwood snags interrupt these expanses that were shaped by hurricanes. Finally, you’ll end up along the shore of Snake Bight, best viewed near high tide. Bear Lake Trail: (walk and paddle) Journey through a dense hardwood hammock mixed with mangroves. The trail follows the old Homestead Canal, built in 1922, and is an excellent area for woodland birds. There are more than 50 different tree species. Bike, drive or walk to the end of Bear Lake Road to begin this trail, which ends at Bear Lake. Eco Pond Trail: (walk) Due to the salt intrusion from storm surges during the hurricane season of 2005, Eco Pond is in a state of change. Wading birds, shorebirds, and occasional crocodiles can be seen. 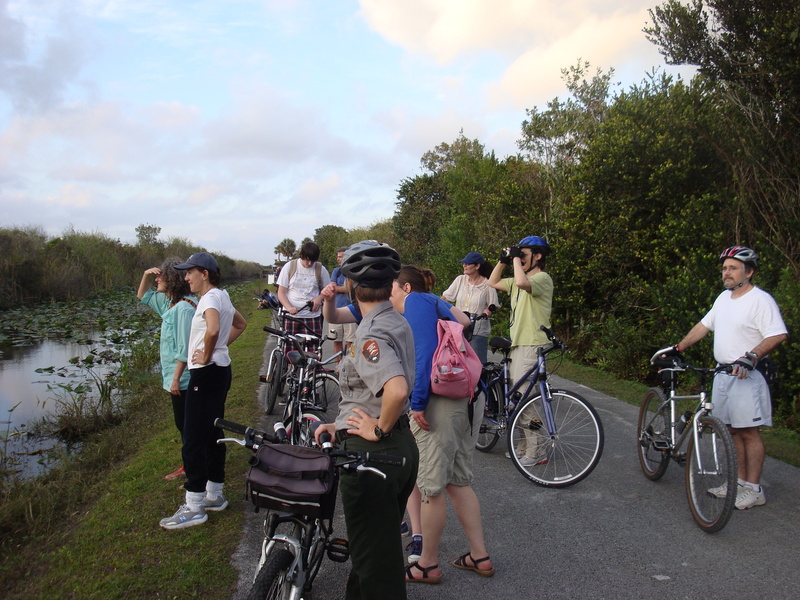 Guy Bradley Trail: (walk) Mingle with a variety of birds and butterflies, as you amble along the shore of Florida Bay. Old pier pilings are a reminder that Flamingo was once a small fishing village. The trail was named for Audubon warden Guy Bradley, murdered in 1905 by plume hunters while trying to protect a bird rookery in Florida Bay. This is a scenic shortcut between the campground day-use area and the visitor center. Bayshore Loop Trail: (walk) Meander along the shore of Florida Bay, watching for remnants of an outpost fishing village. Begin at the Coastal Prairie trailhead at the back of Loop “C” in the campground. Veer left at the trail junction to the bay. Coastal Prairie Trail: (walk) Step back in time as you walk this old road once used by cotton pickers and fishers. Open prairies of succulent coastal plants dotted with shady buttonwoods surround you as you journey toward the shore of Florida Bay. Begin at the rear of Loop “C” in the campground. A backcountry permit is required for camping at Clubhouse Beach. 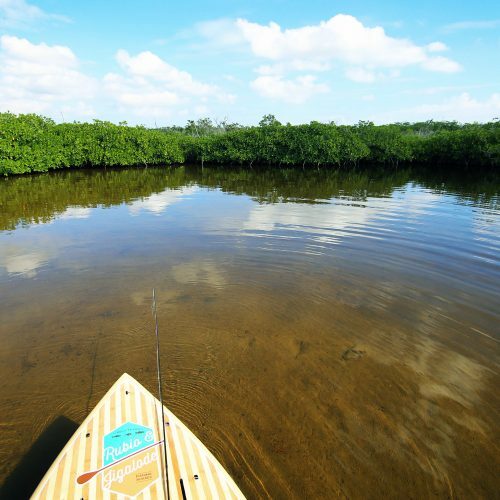 Flamingo’s Canoe Trails: These trails (located 38 miles south of the main park entrance in homestead) range from beginner to advanced and can be accessed from launch areas in the Flamingo Marina or along the main park road as you approach Flamingo. Nine Mile Pond: This is a favorite canoe/kayak location easily accessible off the main park road just before you enter the Flamingo district of the park. Hell’s Bay: This is a favorite of those wanting to paddle through the mangroves – a bit buggy during the summer season – otherwise a challenging trail but quite popular. Also accessible off the main park road south of the Homestead Entrance. 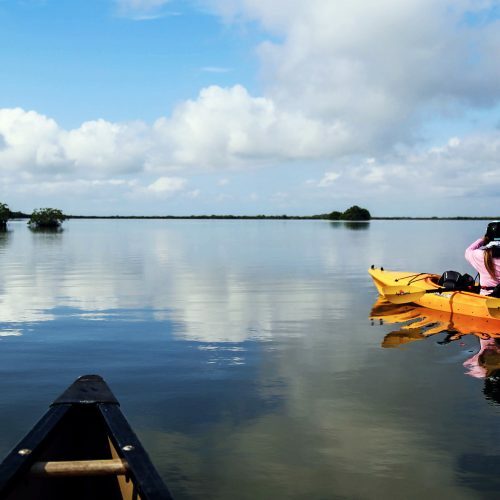 Gulf Coast Paddling Guide: This area of the park is on Florida’s west coast, accessible through Everglades City. 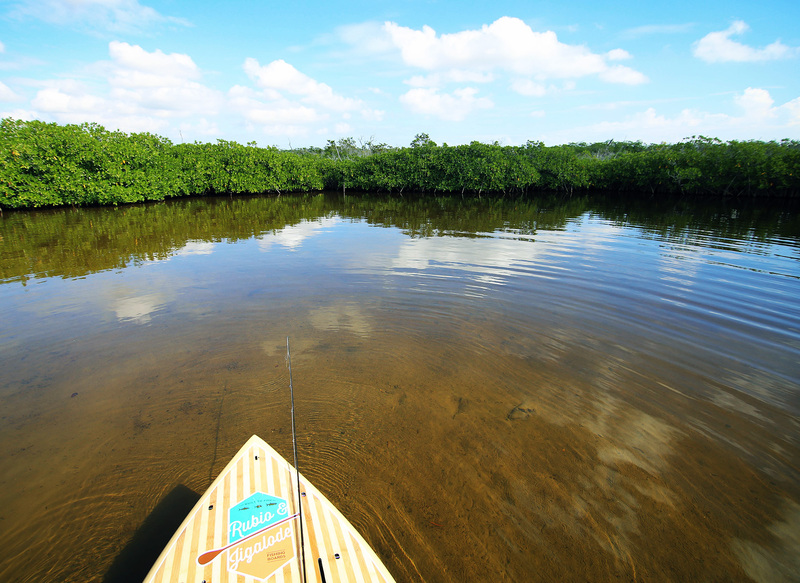 One third of Everglades National Park is covered by water, creating excellent boating and fishing opportunities! Snapper, sea trout, redfish, bass, and bluegill are plentiful. Saltwater fishing includes Florida Bay, Ten Thousand Islands, and elsewhere in the park’s coastal zone. Freshwater and saltwater fishing require separate Florida fishing licenses. Be aware of local fishing information. 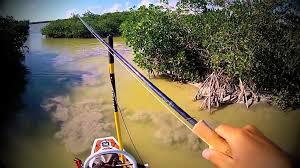 Park waters provide thousands of acres of shallow water flats, channels, and mangrove keys in which to fish. Before leaving shore, think safety! 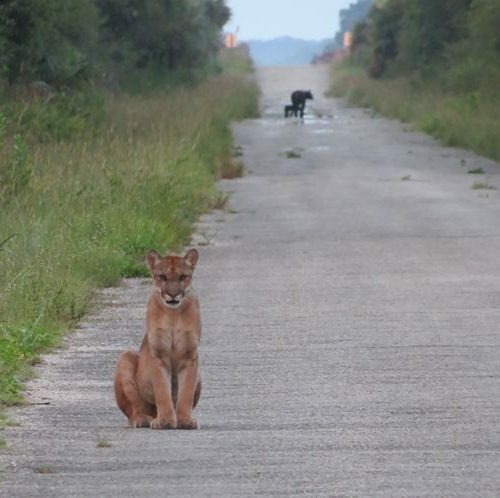 Remember that collecting plants and animals in Everglades National Park is prohibited. This includes such things as orchids, air plants, seahorses, starfish, conch, tropical fish, coral, sponges, sea shells, and driftwood (except for fuel). Florida Fish and Wildlife Conservation Commission Fishing in Florida website. Fishing from the shore is very limited. Follow this link to learn more about shoreline fishing. License: A Florida freshwater fishing license is required to fish in freshwater or to possess fresh water species. Bait: Live or dead fish (including minnows and shiners) or amphibians, and non-preserved fish eggs or roe, are prohibited. Digging for bait inside the park is not permitted. 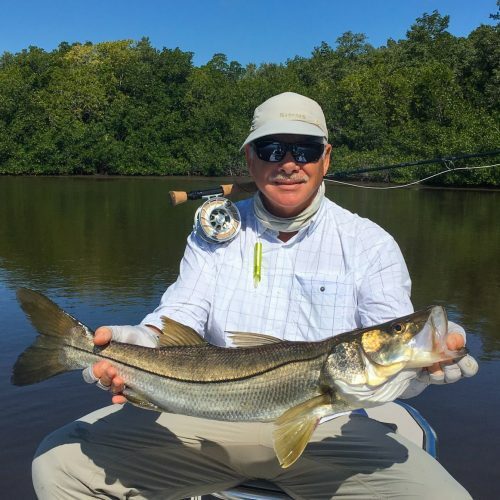 Closed to Fishing: No fishing is allowed at the Ernest F. Coe (Main) Visitor Center lakes, Royal Palm Visitor Center area and trails, Chekika Lake, along the first 3 miles of the Main Park Road, including Taylor Slough, or along the Shark Valley Tram Road. License: A Florida saltwater fishing license is required to fish in saltwater or to possess saltwater species. Bait: Except for mullet and shrimp, is not included in bag limits. Saltwater bait: shrimp, minnows, pilchards, pinfish, mullet, mojarras (shad), or ballyhoo. Bait may be taken with hook and line, dip net (not wider than 3 feet / 0.9 m), and cast net. Closed to Fishing: No fishing is allowed in Eco, Mrazek or Coot Bay Ponds at any time. No fishing is allowed from the boardwalk at West Lake, or at the Flamingo Marina during daylight hours. Lobster and Queen Conch: The taking and possession of lobster and queen conch is prohibited. High levels of mercury have been found in Everglades bass and in some fish species in northern Florida Bay. Do not eat bass caught north of the Main Park Road. Do not eat bass caught south of the Main Park Road more than once a week. Children and pregnant women should not eat any bass. The following salt water species caught in northern Florida Bay should not be consumed more than once per week by adults or once per month by women of child-bearing age and children: spotted sea-trout, gafftopsail, catfish, bluefish, crevalle jack, or ladyfish.